Welcome to Clawson Group Inc. Homes. This is their "La Maison" model featuring 2413 sq.ft. of top of the line finishes. Exterior is a stone, stucco, brick and vinyl combination. Interior features engineered hardwood, ceramic and carpet. Granite surfaces in kitchen, baths and laundry rooms. Open concept main floor with some traditional flow. Living room vaulted to 2nd floor, dining room with trayed ceilings. Kitchen open to eating area and great room with gas fireplace and custom built-ins. 2 piece powder room and laundry finish the main floor. 4 generous bedrooms on 2nd level. 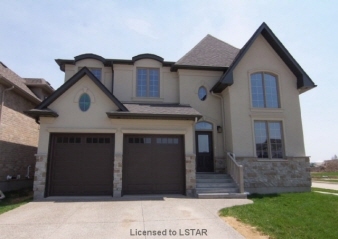 Master with ensuite, walk-in closet and double tray ceilings. 2nd bedroom with trayed ceiling. 3rd bedroom with trayed ceiling and walk-in closet. 4th bedroom with vaulted ceiling. Upper main bath with double vanities and separate toilet/tub/shower room. Great value for the money. Open Houses every Saturday and Sunday between 1:00-4:00pm. Come out and take a look.